Polk County Sheriff's Deputies were first to arrive on the scene of the accident. Driver Rolls Pickup With Kids Inside, Alcohol Suspected, LIVINGSTON, December 25, 2012 - Shortly after 2 am on December 25, 2012, a black Chevy pickup driven by Guillermo Alvarez, Jr., 30, of Livingston, was south-bound on US-59. Alavarez left the road to the right and rolled his truck (Alvarez had his 2 year old and 5 year old sons on board as passengers). Alvaraez's vehicle came to rest upright in the grass on the right side of the south-bound lanes of traffic. Americare Ambulance Service was dispatched to the scene along with Deputy Craig Taylor and Corporal David Ramsey with the Sheriff's Office and Trooper Kevin Burman with the Texas Highway Patrol. Both of Alvarez's sons escaped serious injury (Guillermo Alvarez, Jr. was also uninjured). Trooper Burman arrived and conducted a field sobriety test on Alvarez and placed him under arrest for driving while intoxicated with child under the age of 15. Traffic was not blocked during investigation and cleanup. A rollback wrecker from Ken's Towing recovered Alvarez's vehicle and it will be stored at Harrison Body Shop in Livingston. The scene was cleared shortly after 3 am. 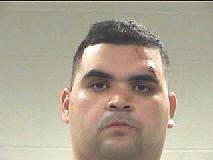 Guillermo Alavarez, Jr., 30, of Livingston, was charged with driving while intoxicated with child under the age of 15. Alvarez's black Chevy pickup appeared to have rolled several times before coming to rest upright. Trooper Kevin Burman arrived and conducted a field sobriety test on Alavarez. Alvarez was placed under arrest. Alvarez's vehicle was recovered by a rollback wrecker from Ken's Towing.